← another day, another atrocity: may I speak freely? Also – I just stumbled across this campaign from June 2008. So it appears Avaaz was assisting in creating acquiescence/support for the destabilization of states/govt’s, since that time. Perhaps even sooner. 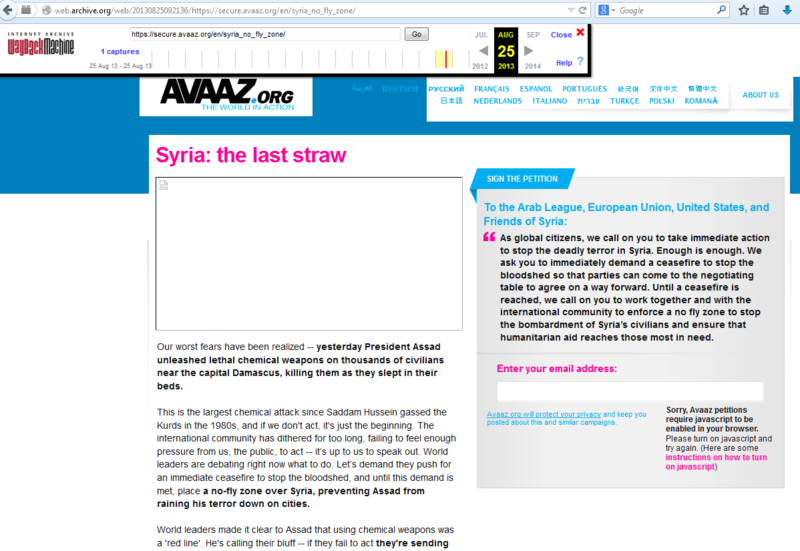 Cory, Great work exposing Avaaz – and thanks very much for the comment. Eva, Thanks very much for reblogging this and for your comment. I just briefly dipped in and skimmed the top layers of your very impressive blog. I will be back! And for my writings from/on Gaza, there is “categories” menu on the right hand side of the blog…. I lived there between Nov 2008 to March 2013 off and on for about 3 years. Thanks again!